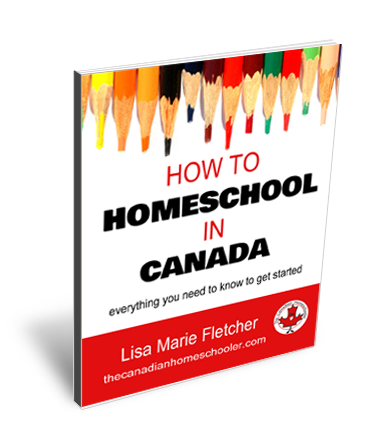 Sign up to my "New to and thinking about homeschooling" email series to get a copy of my How to Homeschool in Canada ebook. Find out the provincial laws, support systems, curriculum resources and suggestions, planning tips and tools, and much more. Everything you need to know to get started. I get regular emails from new to homeschooling parents who are desperately seeking help as they start their homeschool journey. I've narrowed down the top 10 most asked questions and put them together (with the answers I usually provide) in one place - hopefully to help! 1. Am I allowed to homeschool in Canada? Absolutely! 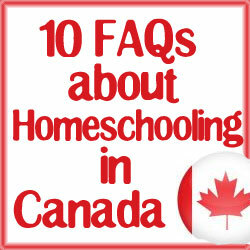 Every province of Canada supports and accepts homeschooling as a valid, legal method of education. Some provinces have more rigid guidelines and expectations for homeschoolers, where others basically leave you to your own devices. 2. My child and school aren't going to work - we've decided to homeschool. What do we need to do in order to take our child out of school? We're sorry to hear that school isn't working out as you'd hoped. The answer to this question actually varies according to where you live in the country. Each province has rules or expectations of what steps to take when you decide to pull a child out of the system to teach them at home. In Ontario and PEI, for example, you just have to send the board a letter that explains your intent to homeschool and you are set. In Saskatchewan, you need to notify your district at least 30 days before the school year of your plans, and maintain a portfolio of what you've completed through the year. I recommend checking out my How to Homeschool in Canada ebook which gives you all the laws and resources for each province. 3. Does the government give us any money for homeschooling supplies and programs? Again, this is province specific. The majority of the times, the answer is a disappointing "no." There are a few provinces that do, however. For example, if you live in British Columbia, the Northwest Territories, or Alberta, you will receive some funding towards your schooling. The amount is dependent on how you register with the government and how independent you want to be in your teaching. 4. Do I have to use a government supplied curriculum? If not, where do I find curriculum - everything I've seen seems to be Christian/American/expensive/overwhelming? In most scenarios, the answer to this question is no. There is no government supplied curriculum, or even a curriculum with a stamp of government approval. You can choose what will work best for your child and family and get started. There may be more regulations on what is expected if you choose to homeschool under a school umbrella however. Make sure to confirm exact details regarding curriculum expectations before buying anything. If you are looking for curriculum, you will notice that the top promoted products are Christian in faith, and American in origin. Although there is nothing wrong with these sets - they aren't a good match for every family. If you would like to find Canadian content, check out the various subject links on this site - where I've been spending years sharing books, resources, and curriculum materials for Canadians. Since, to date, there hasn't been a full Canadian curriculum in a boxed set (unless you know about it, in which case you need to tell me PRONTO! ), you can pick and choose different materials to mix and match your own curriculum materials. 5. Does my child need to be regularly tested - like standardized testing? No - I've honestly never heard of any homeschoolers in Canada needing to be tested with the public school standardized testing system. You CAN choose to have your child take the tests, if you want, or you can use past tests online to see where your child is at, but testing is completely a personal choice and something that many homeschool families feel aren't an important part of their child's education or success. 6. Where can I find a local homeschool group/support group? 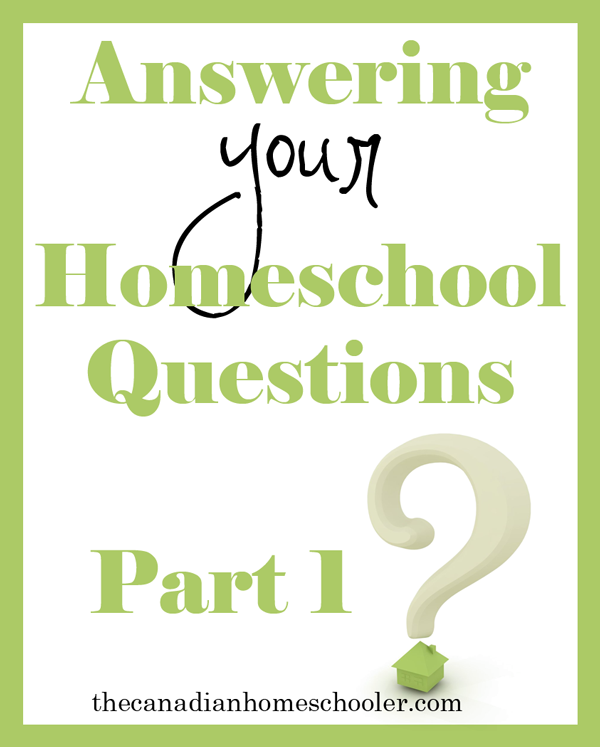 The homeschool community is out there - the challenge is finding them! There are yahoo email groups, Facebook groups, and local meetings. 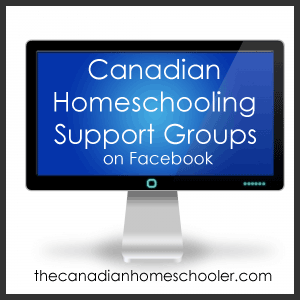 We invite you to join our Homeschool Swap: Canada group on Facebook and my own Facebook page. When you find someone in your community who homeschools, ask them if they belong to a group and see if you can connect. 7. Can you help me pick out curriculum for my kids? Getting started with picking out curriculum can feel like being thrown into the deep end of the pool without a lifejacket. It can be VERY overwhelming. Feel free to contact me with where you live, what ages/grades you are doing with your kids, and what kind of homeschool style you are hoping to use. I can offer suggestions of companies and products I know about that might be a good match for your family. Remember, I don't know everything and my ideas might not work for your family, but I can try to give you a list of suggestions to start from. 8. Do I have to follow the provincial curricula when I homeschool? Unless it's required under the method you register with your local school board (such as an umbrella tree, or distance learning), you shouldn't HAVE to follow the provincial curriculum outlines during your schooling days. However, referring to the government approved guide is a good way to have an idea of around where your child should be in terms of learning. Here is a link to the provincial curriculum outlines. If you are in Ontario, check out the grade by grade checklists. Hopefully, I'll get a chance to work on these for other provinces soon! 9. What about high school? Can we homeschool our high school student? Absolutely. I personally don't have a child in high school yet, so while I've tried to get some info on homeschooling through high school as of yet, I haven't really put together a full plan of action or know exactly what we are going to do that I can share my wisdom of with you. The key thing, I think, is to kind of have an idea of where the journey is leading and work backwards from there to make sure you are completing the requirements to get there. For example, if you have a child who really REALLY wants to become a doctor, you are going to want to find out what the requirements are for post-secondary and see what the best plan of action is to get there. 10. What about post-secondary school? Am I setting my child up for failure? It can be overwhelming to think of how the schooling choices we make at any stage of our children's lives will affect their future educations and career choices. Are we letting them down by not following the norm? Post-secondary is one choice that our kids can do after school years - as is apprenticeship, a job break, travelling. If college or university is your education goal plans, then there are a lot of options available, including registration at an open-university and working directly with your university of choice to establish homeschool requirements. It's a good idea to know what the school you want to go to's policy is on accepting homeschoolers and what requirements you will need to have accomplished to meet them. We highly recommend visiting UniversityAdmissions.ca for more information on what to do as a homeschooler heading towards post-secondary schooling. If you have more questions, you might find the answers in one of these posts. Want to know more about me and why I started this site? Check out my About page.